1. What is Deep Link? take you to a specific section of an app. 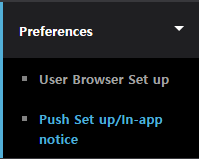 Go to Preferences > Push Set-up/In-app notice and move to the Deep Link tab. 1-4. Click the 'Add Deep Link' button in the Deep Link tab. When Deep Link is successfully added, the list appears in the table below and can then be edited or deleted. 1-5. 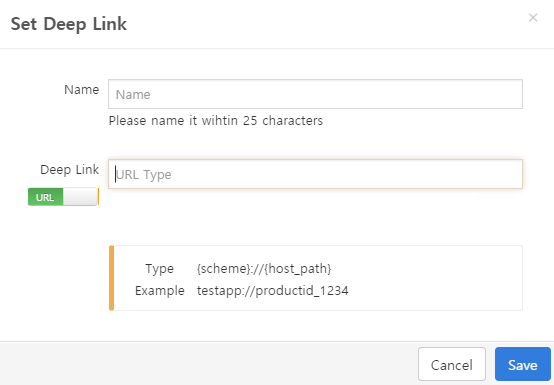 URL Type and JSON Type are available for Deep Link. Choose the appropriate setting according to the guide. For Live Operation, you can create and designate a user group to target. Messages can be delivered to the selected user group through push notifications and notification popups. OS version: Shows the list of users' OS versions for the selected app. Device model: Displays the list of device models of the users of the selected app. Language/Country: Displays the language/country information of users of the selected app. First Installation Date: Extracts users who installed the app for the first time during the selected period. Recent Execution Date: Extracts users whose last login date falls under the selected period. Total Execution Time: Extracts users according to total login time. Total Number of Execution: Extracts users according to number of times executed. Purchase date: Extracts users who bought the IAP during the selected period. Purchase amount: Extracts users according to the total sum of purchases. Number of purchase: Extracts users according to the total number of purchases made. Customization: Customize your targeting option by level, stage, region, etc. Numbers, text strings, true/false option are supported. Sequencing is not supported. : Adds the customized item integrated to the SDK. notification popups can be displayed for the selected user group. Recalculation : Recalculates the number of users for a particular user group at the corresponding point. Send Push Notification : Sends out push notifications to the selected user group. Selecting this will bring up a page to compile push notifications. Create Pop-up notice : Displays notification popups to the selected user group. Selecting this will bring up a page to compile notification popups. Edit : Edits the search conditions for the selected user group. Delete : Deletes the selected user group. : Creates a new user group. Selecting this takes users to the Create User Group page. On this page, you can verify a set of user data within the selected user group, view details such as user ID, push notification availability, OS, etc., and add more data items of your choice. corresponding to the selected user group. : A search can be performed for a created user group. 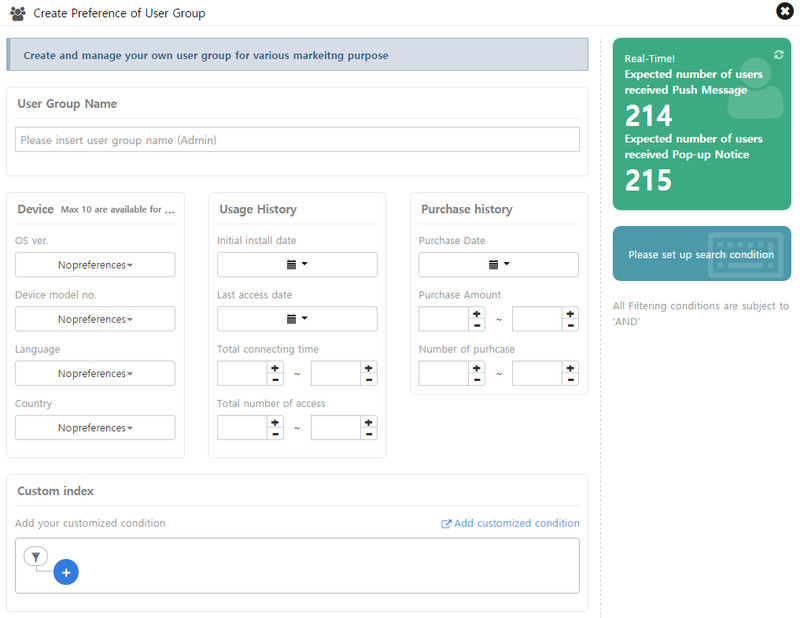 After the search, the users list for the selected user group will be displayed on a table. 1-2. Go to Prefereces >User Browser Setup page and add the parameter value to check from the user browser. Key: Verifies the key value to associate with SDK. Type: Verifies the created parameter type. Custom Parameter Name : Register the name of the established parameter. Click the button to enter. Integration Status: Verifies the integration status of the selected key value. Only key values with verified integration will be available. Delete : Deletes a selected parameter. 1-3. Click on the button to add a custom parameter. Clicking the button brings up the Custom Parameter Setting popup. Enter each section accordingly and save it. Type: There are 4 supported types - String, Boolean, Date, and Number. Key: Enter the key value to use when integrating the SDK. Enter the English characters and numbers without spaces. Name (Option): Enter the name of a parameter to use for admin. Register and set a test device and use it to send/register test push notifications and notification popups. Test messages are visible only on registered devices. 1-1. 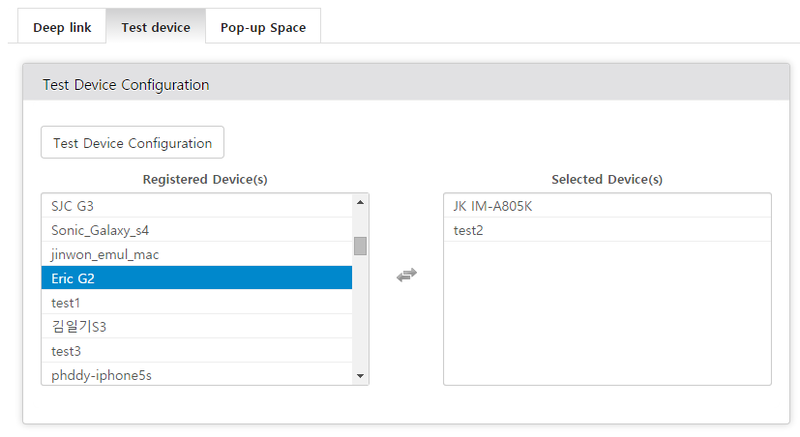 Go to Preferences > Push Set-up/In-app notice > Test Device tab to register your test device. To register a test device, click the 'Test Device' button to open the registration window. 1-2. 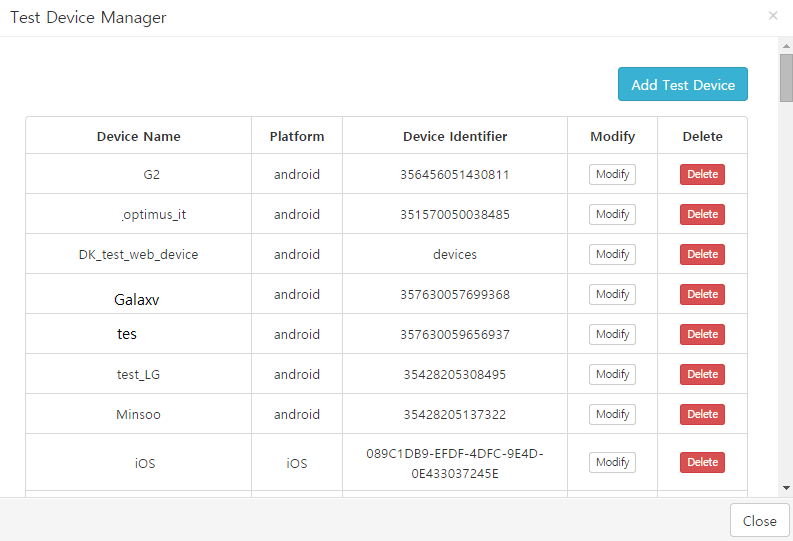 Verify the name, platform and device ID information of the registered test device from the test device management window. Click the button and register your new test device. 1-3. Enter and save the platform, name, and device ID to register the new test device. OS: Select an OS to register for the device. Name: Enter the name of the test device to be used for the admin. Device ID: Register an IMEI value for Android and an IDFA value for iOS. 1-4. Click the registered test device to move it to the pre-set device category and the device will now be available for tests.